Parts of other robot parts MOD can also be used. 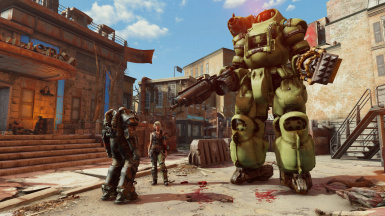 with combination of Fallout4.exe(1.10.40.0) and F4SE(0.6.2). 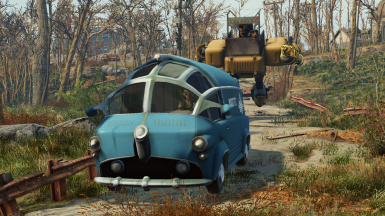 Please use F4SE (0.6.2) in case of latest exe of Fallout4. Currently, PS4's GamePad does not correctly get key input information. This issue is being verified. *Improvement of camera position on robot workbench. It switches at some timing customization. *Added emergency RidableBot call button. RedrocketTrackstop are added near the statue near the statue. *Added a setting item to the Holotape "RidableBot Configuration Menu". -Whether to play the motion when the player rides the robot. -Whether companions ride on the robot at the same timing as the player rides the robot. *Fixed a Handytype of RidableBot flying in the sky. **This procedure is unnecessary if it is updated from Ver.0.93 or later version. please install according to the following procedure. If you do not do this procedure MOD will not work properly. 1.Please get off the RidableBot. Unequip Control Ring and save the game. Please collect if you keep luggage in RidableBot. 2. please uninstall older version of this Mod. 3. Please load the save data of Step 1. *To uninstall this mod, please follow the above steps. 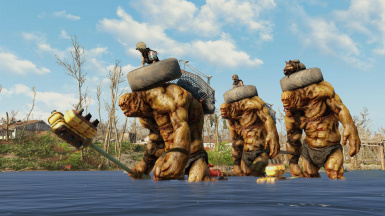 They are located in various parts of the Commonwealth. Player need to wear a "Control Ring" to get on the robot. 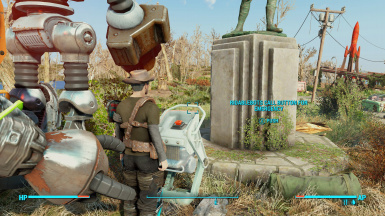 NPC such as Raiders is piloting a robot. Do not destroy the robot. Please take down the ring by defeating only the pilot. 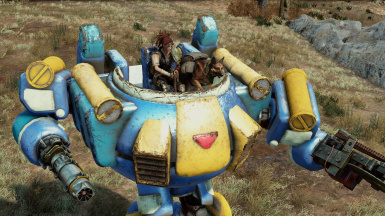 You can ride on RidableBot if equipped with "Control Ring". In addition, the main body RidableBot is located in General Atomics Galleria. Although it is arranged only now, it is planned to create a quest to get this body by Ver.1.00. the same as the player character. when MOD is introduced You can select the type from the "Ridablebot Configuration Menu" Horotape. when the game is loaded Use "RidableBot Configuration Menu". Pressing the R trigger attacks with the right arm's weapon. In case of Behemoth, use this method only. The following action is effective only when weapons are held. Move forward with the jump button. Same button as when operating player character. Pressing the R shoulder attacks with the right arm's weapon. RidableBot will move to avoid in each direction. Left Mouse Click attacks with the right arm's weapon. RidableBot does automatic combat by AI. Move forward with the space key. You can customize RidableBot with robot workbench. 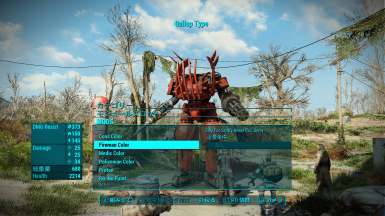 Select from the menu displayed at the end of customization. A RidableBot is created with a skeleton corresponding to it. please make sure that F4SE is properly installed. *Ridablebots can not be made from scratch. *When the robot is destroyed, it re-spawns in 7 days. last piloted is now displayed on the map. *RidableBots are located in the following places etc. Near the "Museum of Freedom"
The location of Ridablebot will be expanded in the future. the camera will not return to the player. We are planning to fix these issues in the future. *The collision of a car is much smaller than it looks. *Fixed the problem that included the script of F4SE (0.4.0) in the BA2 file. The following files have been deleted from BA2. This problem was caused by updating F4SE to 0.6.1 and the key operation was not effective. that the R trigger / L trigger press information can not be acquired correctly. I prepared an operation type that does not use R trigger / L trigger. It responds to the problem that the camera does not return to the player. If you move the player (away from the camera eyebot) the camera will return to the player. *Fixed the problem that the robot moves when the player gets on and off the robot.